The Mojave rattlesnake may be difficult to distinguish from the western diamondback rattlesnake (Crotalus atrox), which inhabits an overlapping geographical range. Some Mojave rattlesnakes are greenish, but they may have a similar color as western diamondbacks. In the Mojave rattlesnake, the diamond pattern fades into bands along the caudal third of the back, whereas the diamonds continue to the tail in the western diamondback. The Mojave rattlesnake's white rings encircling the tail are much wider than the narrow black rings, whereas western diamondbacks have much more predominant black rings. The postocular stripe extends posteriorly above the mouth in the Mojave but intersects the corner of the mouth in the western diamondback. In Mojave rattlesnakes, supraocular scales are separated by fewer than 4 scales at their closest point. In western diamondbacks, at least 4 scales (usually >4) separate the supraocular scales. This is a juvenile Mojave rattlesnake (postmortem). Note that the diamondback pattern fades into bands along the latter part of the snake's dorsum. Photo by Sean Bush, MD. Other rattlesnakes in the Mojave rattlesnake's range and niche are distinguishable by the absence of a dorsal diamond pattern with light margins, black and white tail rings, facial stripes, or by the same criteria used to distinguish Mojave rattlesnakes from western diamondbacks. Venom A populations of Mojave rattlesnakes possess Mojave toxin, which has been experimentally shown to induce neurotoxic effects. 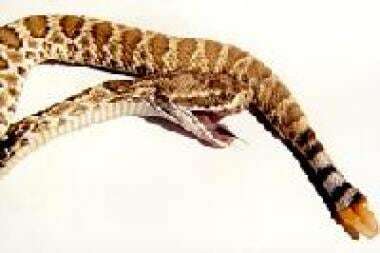 Mojave toxin or a similar toxin has been detected in the venom of other rattlesnake species. This toxin impairs presynaptic acetylcholine release. Mojave toxin may cause severe neurologic effects clinically, although this presentation has been reported only a few times in the literature. Envenomation by several other species of rattlesnakes has been reported to cause serious neurologic signs and symptoms (eg, severe motor weakness, respiratory difficulty). Venom A Mojave rattlesnakes cause less local injury and less hemorrhagic/proteolytic effects than other rattlesnakes. In contrast, venom B specimens cause local, proteolytic, and hemorrhagic effects typical of other rattlesnakes. Severe rhabdomyolysis with myoglobinuric renal failure has been reported with Mojave rattlesnake envenomation. [7, 8, 9] This article focuses mainly on envenomation by venom A populations of Mojave rattlesnakes. A large percentage of bites occur when the snake is handled, kept as a pet, or abused. These bites are considered intentionally interactive. Young adults are most commonly bitten. Full recovery is usually anticipated. Before antivenom, estimates of mortality rates ranged from 5-25%. Because of the development of antivenom, rapid EMS transport, and emergency/intensive care, mortality rates have improved to 0.28% (or better) when antivenom is administered and to 2.6% when antivenom is not administered. Mojave toxin is one of the most lethal venom components found in US snakes. Venom B populations are less lethal than venom A populations. At least one death has been attributed to a Mojave rattlesnake in the Annual Report of the American Association of Poison Control Centers, although a number of deaths have been documented. [10, 11] Most documented deaths are associated with bites in which the bitten individual was intentionally interacting with the snake and when a delay occurred in seeking medical care. Call professionals, such as animal control, to move snakes (if it is necessary to move the snake). Never attempt to handle, possess, or kill venomous reptiles. For patient education resources, see the patient education article Snakebite. Farstad D, Thomas T, Chow T, Bush S, Stiegler P. Mojave rattlesnake envenomation in southern California: a review of suspected cases. Wilderness Environ Med. 1997 May. 8(2):89-93. [Medline]. Hardy DL. Envenomation by the Mojave rattlesnake (Crotalus scutulatus scutulatus) in southern Arizona, U.S.A. Toxicon. 1983. 21(1):111-8. [Medline]. Hardy DL. Fatal rattlesnake envenomation in Arizona: 1969-1984. J Toxicol Clin Toxicol. 1986. 24(1):1-10. [Medline]. Glenn JL, Straight RC. Intergradation of two different venom populations of the Mojave rattlesnake (Crotalus scutulatus scutulatus) in Arizona. Toxicon. 1989. 27(4):411-8. [Medline]. Jansen PW, Perkin RM, Van Stralen D. Mojave rattlesnake envenomation: prolonged neurotoxicity and rhabdomyolysis. Ann Emerg Med. 1992 Mar. 21(3):322-5. [Medline]. Massey DJ, Calvete JJ, Sánchez EE, Sanz L, Richards K, Curtis R, et al. Venom variability and envenoming severity outcomes of the Crotalus scutulatus scutulatus (Mojave rattlesnake) from Southern Arizona. J Proteomics. 2012 May 17. 75(9):2576-87. [Medline]. Bush SP, Cardwell MD. Mojave rattlesnake (Crotalus scutulatus scutulatus) identification. Wilderness Environ Med. 1999 Spring. 10(1):6-9. [Medline]. Carstairs SD, Kreshak AA, Tanen DA. Crotaline Fab antivenom reverses platelet dysfunction induced by Crotalus scutulatus venom: an in vitro study. Acad Emerg Med. 2013 May. 20(5):522-5. [Medline]. León G, Segura A, Herrera M, Otero R, França FO, Barbaro KC, et al. Human heterophilic antibodies against equine immunoglobulins: assessment of their role in the early adverse reactions to antivenom administration. Trans R Soc Trop Med Hyg. 2008 Nov. 102 (11):1115-9. [Medline]. Mojave rattlesnake (Crotalus scutulatus). Note the diamond pattern fades into bands along the caudal third of the back and the white tail rings are wider than the black. Photo by Sean Bush, MD. This is the typical appearance of a southern California Mojave rattlesnake bite site. Photo by Sean Bush, MD. Mojave rattlesnake (Crotalus scutulatus). Photo by Sean Bush, MD. A red diamond rattlesnake (Crotalus ruber). The postocular light stripe extends above the angle of the mouth in Mojave rattlesnakes. Photo by Sean Bush, MD. A western diamondback rattlesnake (Crotalus atrox). Photo by Sean Bush, MD.